In his 2017 exhibition currently on show at Tate Modern, Wolfgang Tillmans uses photography to offer commentary on the socio-political situation the world has found itself in. But what is noticeable is that Tillmans generally does so without directly referring to politics or economics, and without aligning himself with a particular point of view (with the notable exception of his posters encouraging people to vote Remain in Britain’s EU referendum). By capturing individuals and details of contemporary life, Tillmans makes a record of the present reality that causes us to question what reality means. In a world in which post-truth has been made the Oxford English Dictionary’s word of the year and psychologists reveal the inherently biased nature of each individual’s world view, it’s a pertinent time to be examining the present. Tillmans’ approach echoes the point of view of a small group of Japanese photographers who emerged in the late 1960s. In 1968, this group published the first issue of the aptly named Provoke journal, an avant-garde magazine of experimental photography. A new movement was born, one which would have a significant influence in Japan and beyond. These men sought to use photography to capture “fragments of reality”; to chart lived reality in the fragmentary way in which we experience it. The year 1968, in Japan as well as in the rest of the world, saw widespread political uprisings by students protesting against the oppression of intellectual and civil liberties. It’s an era that has prompted a number of comparisons with the socio-political situation today. Provoke was born out of this volatile environment, but the photographs it featured were not actively political in terms of subject matter. Instead, much like Tillmans’ work, the Provoke movement offered a subtle form of protest through their use of photographic process and their formulation of a radical new aesthetic called “are-bure-boke”, which can be roughly translated as “grainy/rough, blurry, out of focus”. The Provoke journal and its photographers offered a subversive vision of life at the margins. By capturing images which embraced amateur-style snapshots and the margin for error inherent in analogue photography, the Provoke photographers created a new visual code which was shockingly at odds with the emphasis on technological precision promoted by the Japanese economy. Although the publication of Provoke coincided with the 1968 protests in Japan, the journal’s aims and methods were different from those of the mass movement. Instead of using photography to make a direct political point or to represent the struggles of the protesters, the photographers of the Provoke movement actually avoided explicitly aligning themselves with the masses. As critic Duncan Forbes puts it, Provoke “sought to break the circuit of representation of constituent power, ‘freeing’ photography from the shackles of protest, notably through the abandonment of the commons and any attempt to represent it.”[i] Although Provoke was in some ways itself a radical form of protest, it was also freeing itself from the problems of protest by distancing itself from the specificity of urban congregational spaces or explicit political slogans made in words. Instead, the Provoke movement used its unique aesthetic of blurred disorientation to destabilise the urban environment and, consequently, the social context. Their work also privileged the role of the individual, rather than the group, as a valid conduit for seeing the world. Provoke provided a space for contemplation and for recognising the people, places and activities ignored by the country’s booming consumer culture. And, perhaps most importantly, it prompted discussion; about art, about lived reality, and about the country’s socio-political situation. The movement’s protest could be found not so much in what it said, but in what it got other people to say. And it’s this, perhaps, which offers a useful lesson for artists today. While forthright political statements and slogans have their place in art and can be powerful instruments for dissent, there is a feeling that words have become too messy, too caught up in politics, to be the most useful tool for an artist. Instead, it’s perhaps the works that prompt other people to speak that are the most powerful. More than that, it’s the works that prompt other people to think. This is something that art has the power to do. Rather than simply confirming the current (and fairly depressing) “reality”, art can suggest that reality is in fact multifaceted and fragmentary, and that it incorporates legitimate lives and ideas that are ignored by the mainstream media and political discourse. For the Provoke group, their photography demonstrated the dirty, unglamorous and sometimes sordid underbelly of Japanese life, offering an alternative vision of the country . Their radical new aesthetic also made this hidden world attractive in some ways; although the associations of the photographs aren’t entirely positive, their compositional elegance and the talent of the photographers gave weight to the idea that this alternative life was a viable and real element of contemporary society, not something to ignore or discount. Often in the most powerful art, such a vision of alternatives is hinted at rather than spelled out, which sometimes makes it more compelling than in-your-face arguments. It shows people that their own version of reality is not the only one worth considering. The role of protest in art and the power of art to effect change is something which has got a lot of commentators talking recently. Frieze carried out a large-scale survey of over 50 artists, curators and writers to ask their opinions on the topic. Over in the general press, The Atlantic asked how art should address human rights, questioning where the balance lies between artistic self-expression and respect for the sufferers of human rights abuses. Taking a different angle, The New York Times recently examined the reasons behind why authoritarian governments attack the arts and the potentially privileged position that artists sometimes find themselves in. Opinion is divided on where artists should stand, and there is no perfect model for protest in art. Of course, the Provoke movement has its problems and its detractors, and it is certainly not unique in this. It was undoubtedly a boys’ club; women were roundly excluded, apart from when being presented as sexualised objects. And you could argue that offering such a subtle form of protest was another way of sticking their heads in the sand and ignoring the political problems unfurling around them. 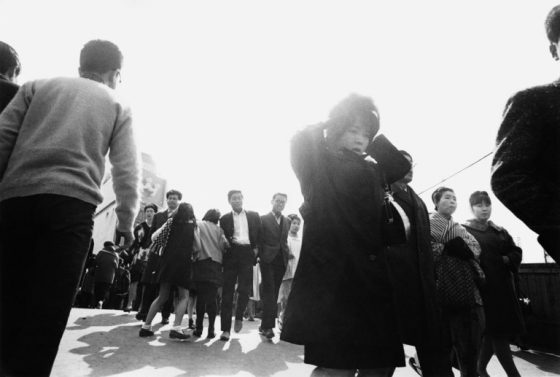 But their work has lasted, drawing attention back to the Japan of 1968 again and again, prompting commentators to ask questions about the social and political environment of that era and what it meant for the development of art. Of course, a few artists taking poignant and beautiful photographs isn’t enough to effect social change, but nor, as Eric Liu argues, is outspoken protest. Maybe what we need is a powerful combination of the two which can aid the process towards progress.